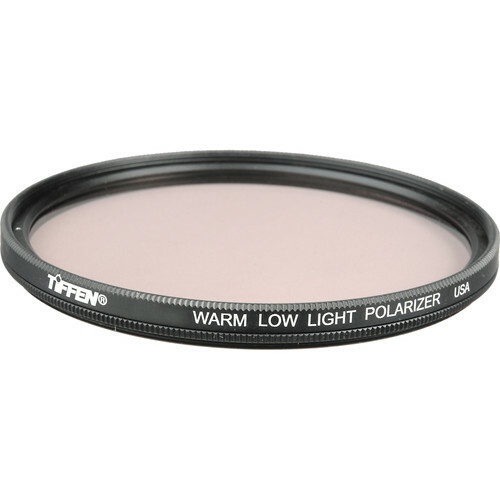 Blending two distinct filter effects into one, the 58mm Warm Low Light Linear Polarizer Filter from Tiffen helps to reduce reflections and glare as well as provide an overall warming tone. The Ultra circular polarizer effect provides deep, saturated, and rich colors and efficiently cuts haze and reflections from non-metallic surfaces. Complementing these effects, the incorporation of a Warming 812 filter into the design adds a natural glow to skin tones and other subjects, making it ideally suited for use in outdoor open shade conditions where there is an excessive blue color cast. This low light polarizer has less of a polarizing effect than a standard polarizer, allowing for it to be used in indoor and darker situations when available light is at a premium. This filter is also more ideal to pair with others so the filter factor does not become overwhelming. The low light linear polarizer requires approximately 1 stop of exposure compensation. A linear polarizer differs from a circular polarizer in that it does not supports use of a camera's autofocus or auto exposure functions; it is best suited for use with manual cameras, such as view cameras, that are not dependent on internal mechanisms to determine focus or metering settings. Tiffen filters are made using ColorCore technology, a process that involves laminating the filter substrate between 2 pieces of optical glass, grinding flat to a tolerance of 10,000th of an inch, and then mounting to precision metal rings. Low light polarizer is less dense than a standard polarizer, allowing for greater light transmission and more versatility when working in darker conditions. Warming 812 filter effect provides an overall warm tone to the image and is ideal for working in conditions with an overwhelming blue color cast. Constructed using Tiffen's ColorCore technology. Box Dimensions (LxWxH) 3.7 x 2.9 x 0.7"